rv-pro.com November 2018 • RV PRO • 85 The familiarity also is felt by the company's customers, who get more facetime with Samlex representatives than they might expect, and who are guaranteed that a real person will answer the phone. Not surprisingly, the company takes great pride in its customer engagement initiatives and its familial-style work environment. Since the power conversion supplier entered the RV market 10 years ago, it has significantly increased its distribution, touching more than 5,000 dealers across North America. Somewhat unknown to the RV industry prior to that time, the company quickly became a top three leader in its category, according to Hamanishi, who notes Samlex was previously focused on serving the utility fleets and the communications (wirelines, two-way radio, etc.) markets. "The RV market came after us," he says. "We were getting phone calls with people asking where they can get our stuff. These were RV dealers." 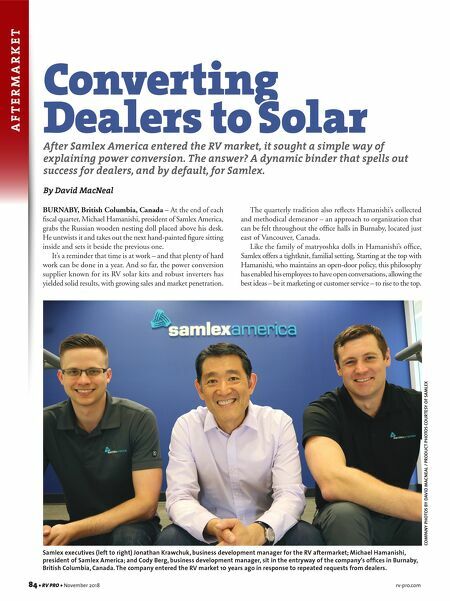 It was a market Samlex decided it needed to address, so it set up RV distribution channels. The company began by selling inverters, but soon realized it needed to address the RV market with specific products. So, Samlex built charge controllers for RVs and made sure that solar panels were designed to properly fit RVs. At the same time, the company worked to determine who the Krawchuck practices his presentation using the company's Dealer Success Binder, which takes complex ideas about power and simplifies them into education tidbits that helps dealers determine and plan for RVers mobile power needs. 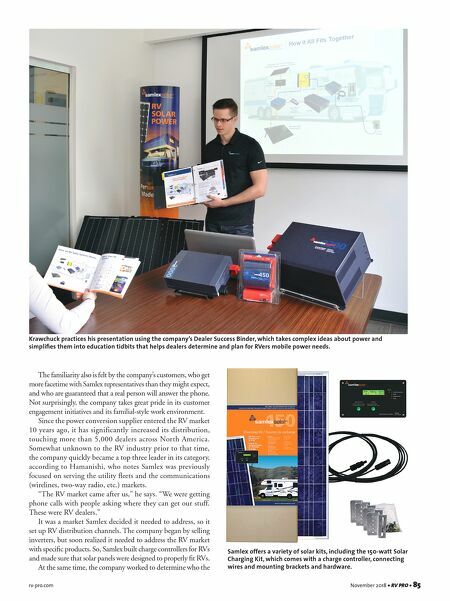 Samlex offers a variety of solar kits, including the 150-watt Solar Charging Kit, which comes with a charge controller, connecting wires and mounting brackets and hardware.